Family Equality Council for the 12th annual Los Angeles Awards Dinner @The Beverly Hilton. 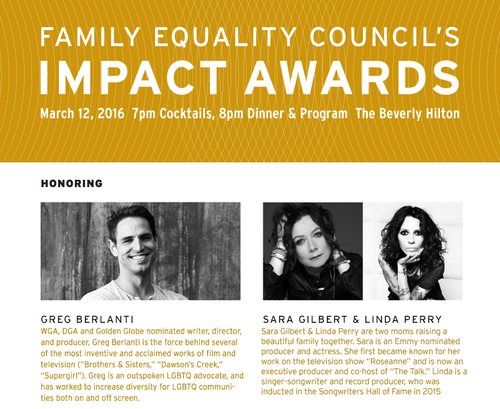 This year’s Impact Awards will honor writer/director/producer (and new dad) Greg Berlanti, as well as moms Sara Gilbert, producer/actress and Linda Perry, singer/songwriter and record producer. Comedienne Caroline Rhea MCs. Performances by Linda Perry, Jeremy Jordan, Levi Kreis.